This January, we teamed up with fellow top Xero app, Practice Ignition, for a three week whistle-stop tour of Australia alongside the Xero Roadshows to share how to make the most of the latest software in your practice. We called it The Essential Technology Playbook. And it was such a success, that we’re going to be bringing these roadshows to the UK – don’t miss out! In 2018, the discussion is shifting from transitioning to the cloud to optimising the cloud experience. Add-ons and apps are more prevalent than ever, and the ability to automate manual tasks is more and more of a reality. 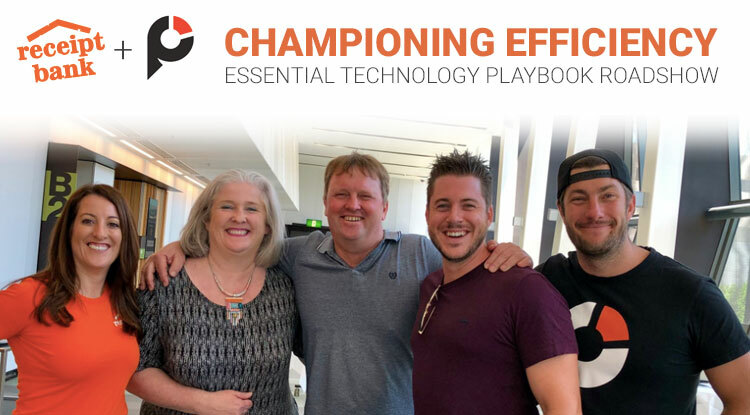 For the roadshows, we were joined by Practice Ignition to debut Practice 2018: The Essential Technology Playbook. Just as we help automate the manual work of bookkeeping, they automate client and practice management, so they make the perfect partner with whom to present the ‘efficiency dream’. It was awesome to see some of our partners at the events, who shared they they’re saving an average of 10 hours a week with Receipt Bank. As well as helping their businesses, this gave them the opportunity to get their weekends back and spend more time with their families. A number of our partners also said that the ability work remotely with Receipt Bank and Practice Ignition gives them more freedom and helps restore a work/life balance. It was so encouraging to see how people are using Receipt Bank to accomplish their individual and practice goals! If you want to find out how you can do the same, sign up for one of our UK roadshows. As part of the Playbook, we looked at how a streamlined tech stack can aid in troubleshooting client issues. Apps provide easy solutions for previously difficult or awkward situations. Practice Ignition, for example, offers clients the option to pay their bill directly through the app, eliminating the long-winded process of chasing payments. Similarly, Receipt Bank’s Outstanding Paperwork reports means you can generate a list of missing documents in seconds, so there’s no need to go through every transaction in order to find the missing link. We would like to thank everyone who came along to the events – we had a fantastic time gaining such great insights from both our panelists and our attendees. Now to do it all again: as of 1st March, we’ll be hitting the road with Practice Ignition in the UK for three weeks starting in Norwich. If you are based in the UK and like the sound of meaningful discussions on the possibilities of the cloud over a free breakfast, then make sure to register for one of our events!